I ran across this in the bookshelves at a local book store when I was browsing for a new author a few months back, and was intrigued by the blurb on the back cover (ironically by an author whose name didn’t ring any bells, despite the “New York Times bestselling author” appellation). What I didn’t realized when I bought it, based on the way DAW was marketing it, was that rather than being the first in the series, this was actually the second book. (And can I digress here a moment, to complain about how truly NON-USEFUL it is to have publishing houses pick up a series at the second book and not provide readers any guidance about other, previous books that author has produced, because they’re on a different label?? In this case, Luna bears that imprint, and I shudder to think what kind of politics played into the decision to carry on as if the second book were the first in the series. In a tweet 11/16 @laresnick says it will be reprinted by DAW June, 2012.) Thankfully, Resnick seems to have recognized that this might be an issue, and has back-loaded information from Disappearing Nightly as appropriate into this installment of her ongoing Esther Diamond series. This did mean there was some repetitive information built in to the story line, as if to ensure the reader doesn’t miss the fact that Esther is a struggling actress who really has no special skills apart from acting–and a penchant for getting herself into sticky situations. She’s a smart-mouthed woman not unlike Stephanie Plum and in this installment is working as a waitress at a known mob hang-out. This, naturally, is a bit of a concern to her cop almost-boyfriend, who is trying to solve murder mysteries of his own. OK… Maybe just that one paragraph doesn’t convey the hilarity of a chick dressed like an Italian mobster’s gumata talking to another Italian mobster’s widow in a church, while trying to subtly (as subtly as a bull in a china store, really) pump her for information. Most urban fantasy heroines come with some sort of power of their own, so finding one who is down on her luck, and as common as they come and thus reacts to the wildly strange apparitions that start plaguing her life with the aplomb of a seasoned New Yorker who knows that if you just treat them normally they’re likely to go away on their own, is a real treat. I can highly recommend this one as a funny revisioning of the common urban fantasy tropes, that focuses more on the murder mystery and romance angles than the paranormal side–though that is deftly woven into the mix as well. And I’m excited that there are two more books planned in the series, for a grand total of six, so keep your eyes open with me for more publication information upcoming. HI, thanks for reviewing the book! There are more than 6 Esther Diamond novels, planned–the series is just currently under contract through #6. The problems of relaunching a series with book #2 is plagued by practical sales/marketing problems (rather than politics), which is precisely why most series never get that chance. So I’m really glad that DAW Books believed enough in Esther Diamond’s potential to give it a try–and also really glad that it’s worked well enough that we’re finally able to reissue Disappearing Nightly, the series’ first book, in 2012, as part of the relaunched series. 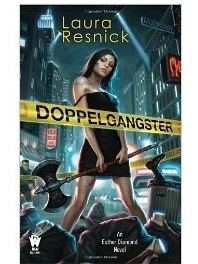 Readers having been asking about it steadily ever since Doppelgangster came out. You weren’t missing much – starting with the second book is a good idea. It is a better novel entirely!